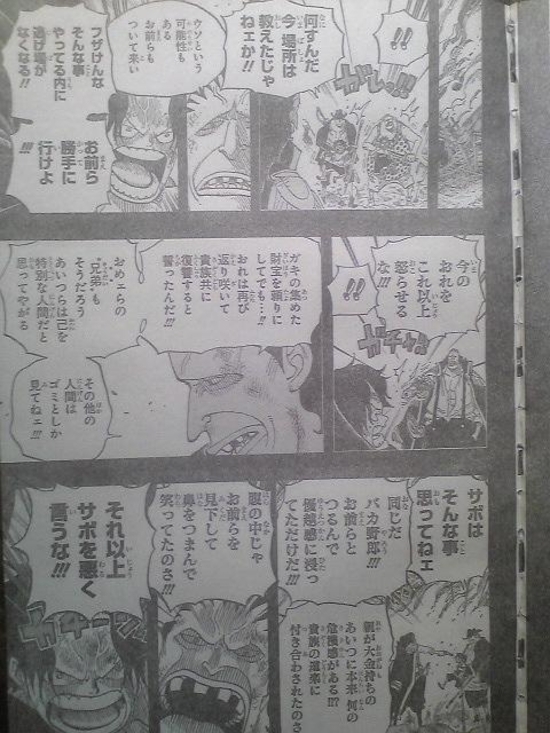 Chapter 587: "I won't run away"
Ace: What the hell are you doing!! I just told you where it is!! Ace: You got to be joking!! That'll leave us no time to run!! You go ahead on your own!! BlueJam: Don't piss me off right now!! Even if I have to rely on the treasures you kids collected, I swore to bring revenge on the nobles!! your "brother" is just like them! They look at themsevles so special, and consider all other humans as trash!! Ace: Sabo doesn't think that way!! BlueJam: No, it's the same you fool!! He was just feeding his ego by hanging out with you!! Why would he ever feel threatened with a rich parents like that!? You guys were just toyed around by a noble's whim!! Deep inside, he was always looking down on you, and laughing at you!! Ace: don't you dare speak about Sabo like that any more!!! Luffy: That's right, Sabo just wanted to be free!! Pirate: I'm gonna kill him...! Ace: DON'T YOU LAY A HAND ON LUFFY!!!!!!!! BlueJam: What the hell did you just do, you freakish kid!!! 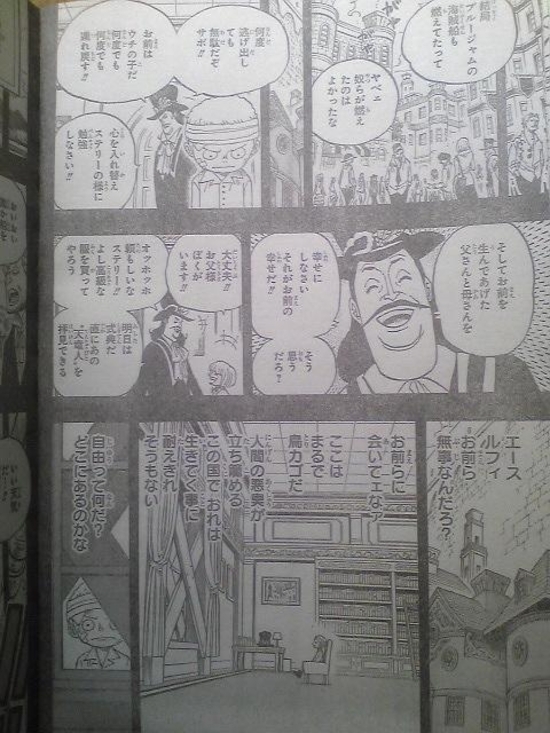 Dadan: Stop it, you sea bonze!! Let Ace go!! Luffy: ....!? Dadan! Why are you guys here!? Dogra: Man, you're hurt badly, Luffy!! Luffy: Dogra! Have you seen Sabo!? BlueJam: You... you're the boss monkey of the Colbo mountain, aren't you? 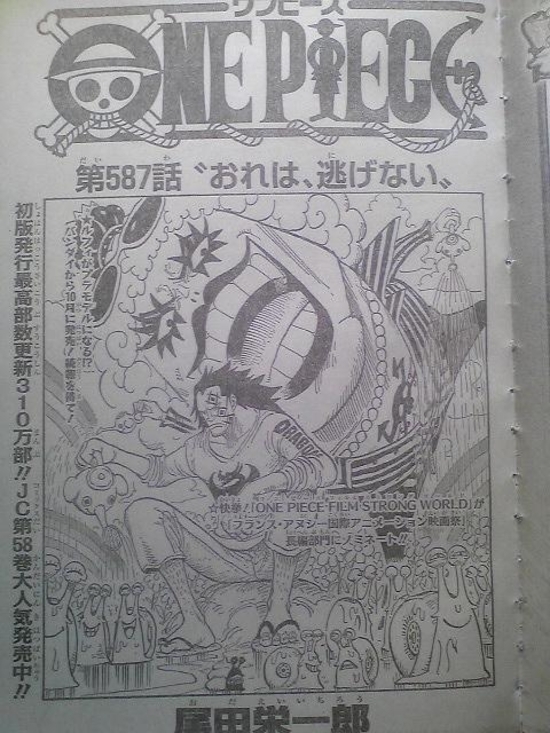 Dadan: I'm the mountain bandit Dadan!! Through odd fate, I've been appointed foster parent to these brats. Alright, you guys... now we.... RUN!! Bandits: Yes boss!! Hurry up, Ace!! Ace: I won't... run away!! Dogra: What are you talking about Ace!? Don't mess with him!! BlueJam's infamy isn't for nothing!! He's not at the level that a kid like you should trifle with!! Dadan: You guys, take Luffy and go ahead!! Dadan: I swear I'll bring Ace home!! Now GO! Boss!! Please come back to us safely!! BlueJam: A woman and a child.... heh. Just because you're confident with your skills... don't over estimate yourself. The onlyes ones to live through a warzone are the "strong" and the "cowards". the "brade" are fated to die....!! trash mount citizen: No... it's no good!! we're surrounded in flames! citizen: it's hot...!! I can't run anywhere!!! Why did this happen suddenly!? Magra: Ma-ma-wait Luffy, where are you going in a shape like that! Luffy: I'm going to go look for Ace and Dadan!! Magra: don't be silly!! Your wounds are deep, ma-ma-just stay put! If you go right now, they'll kill you!! Luffy: but...!! I want to see Ace!! And I know Sabo is worried about him too!! Soldier: Damn, it stinks!! I bet the fire burned them out down to the bones! Ivankov: I can't believe you were keeping eye on such a remote area of East Blue. Is this place special to you? Sabo flashback: If I stay here, I can't be free!! Dragon: Even in a nation like this, children are born every day..!! Dragon: Anyone who wishes to fight for freedom, get on this ship!!! citizen: They say BlueJam's pirate ship was burned down as well. Sabo's father: It's no use to run away, Sabo!! You are our child, I will bring you back here again and again! You need to have a change of heart, and study like your brother Stelly! 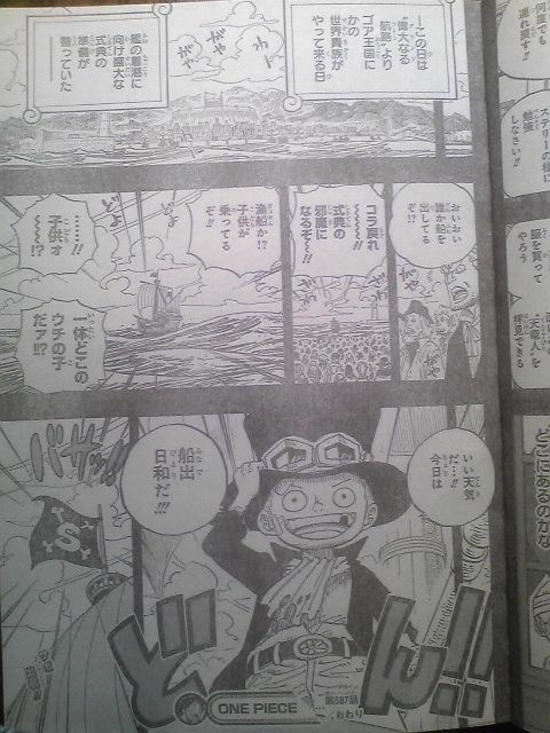 Sabo's father: then you need to make your father and mother happy for bringing you to this world. That is your happiness, don't you think so? Stelly: Don't worry father, I'm here!! father: oho ho, how reliable of you Stelly! Here, let's go buy you some expensive clothes. Tomorrow is the ceremony, we'll get to see the Celestial Dragons with our own eyes! Sabo: (Ace... Luffy... you guys are alright, right? I wanna see you guys so bad... this is like a birdcage here. I don't think I can stand living in this city reeking of human corruption. This day is the day the World Nobles from the Grand Line arrive to the Kingdom of Goa. Kingdom was preparing for a massive ceremony to welcome the ship. citizen: hey, someone's sailing on the ship! Hey!! Out of the way!! you'll get in the way of the ceremony!! Is that a fisherman's boat!? There's a little child on it! What!? A child!? Whose child is that!? Sabo: This is a good day! It's a perfect day to set sail! !